A more thorough procedure is the deep plane minituck, in which the surgeon lifts the muscles, connective tissue and fatty tissue under the skin of the cheeks so as to create a naturally youthful look. 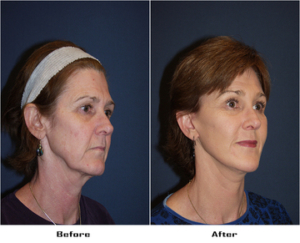 This procedure works better with patients who have loose skin around the midface, neck and near the mouth, and less fat around the jowls. Every lift should be tailored to the face of the individual patient, taking into account age, the thickness and texture of the skin and the shape of the bone and soft tissue. In some cases, the surgeon will shave the backs of two of the salivary glands to further improve the appearance of your cheeks, and will include a brow or neck lift for a consistent look. The sutures have to stay in for close to a week, and the facial bruising and swelling may last several weeks. There may also be some bleeding from the incisions before they heal. The process of recovering from a facelift tends to be unsightly, which is why many patients prefer to remain indoors until fully healed. Dr. Sean Freeman is the best facial plastic surgeon in Charlotte, NC. His SignatureLift is similar to the weekend facelifts. It can be performed under local or general anesthesia, and there is minimal swelling and bruising afterward. It is individually tailored to the patient, and gives you a younger-looking neck and jowl area with a much shorter recovery time than other facelifts. Dr. Freeman has devoted himself to facial plastic surgery and nonsurgical cosmetics since 1988 and has been certified by two different surgery boards, the American Board of Otolaryngology (head and neck surgery) and the American Board of Facial Plastic and Reconstructive Surgery. If you’re interested in a facelift, make an appointment with his office today or schedule an online consultation for a discount on the consultation fee.